Whether you're investigating individuals or companies, get fast and reliable results with these public and proprietary records tools. CLEAR is the premier online research tool that helps you easily find the facts and connections you need for investigations, fraud prevention, fraud monitoring, and skip tracing. Discover information about people and their connections quickly and confidently. 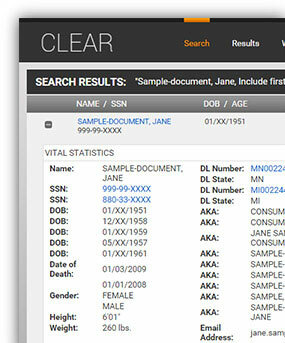 Easily filter your search of millions of public records to see the most relevant results at the top. Content includes criminal records, real property, work affiliations, social networks, and more. With a few clicks, your investigation covers millions of current and historical public records. Scan data from government agencies, consumer bureaus, and businesses to learn about people and their assets, potentially adverse information, criminal records, and USA PATRIOT Act compliance. Company Investigator lets you visualize corporate family tree structures, determine relationships among corporate entities, and generate reports and alerts for companies of interest. When your investigation needs court documents or records from the United States, Canada, and other countries – documents that are not currently available online from any court, agency, or library – turn to Court Express. This Application Program Interface (API) solution eliminates the need to manually transfer data between applications. Search millions of trusted CLEAR records along with your own internal data – right from your organization’s interface. Augment your investigation by uncovering a party's legal history using the Westlaw online collection of court dockets – the most extensive available. Track the status of cases, obtain court filings, and search more than 1,100 courts from 35 states and all federal jurisdictions. Screen for heightened risk individuals and entities globally with Thomson Reuters World-Check, to help you know your customer and uncover hidden risks. The simple act of searching public records with PeopleMap, CLEAR, Company Investigator, or Batch Services can have a powerful impact on your clients and community. Our Everyday Heroes program honors those who have made a difference using these tools. Three Everyday Heroes each year can win the chance to donate $10,000 to a deserving charity.